I trained as a Surface Pattern and Textile Designer and now work from an attic studio in a converted manse in rural Northumberland. I run textile workshops at The Hearth and throughout the UK and make work to sell and exhibit. I treasure the old and worn, refashioning vintage textiles into new collages which are embellished with stitch and appliqué. I re-cycle and reuse very old and often disintergrating materials which have been passed on or discarded. I particularly like to cut up and unpick utility patchworks and quilts made by women in domestic settings. 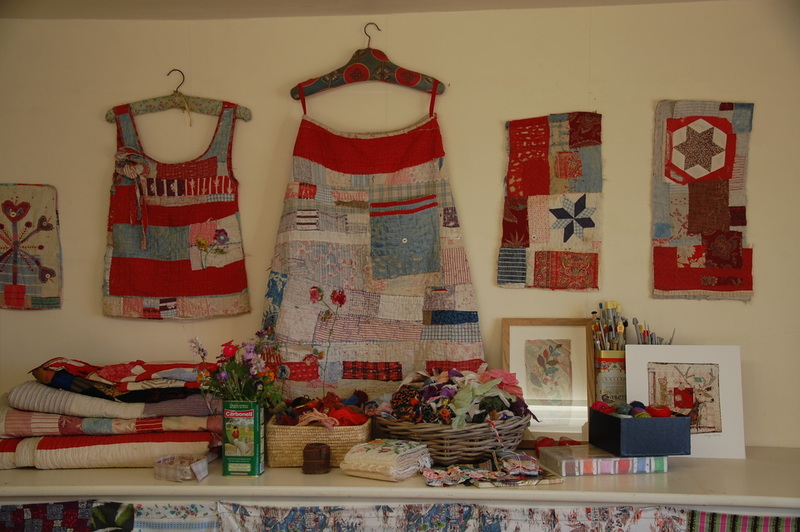 I consciously relate to the thrift and ‘make- do and mend” culture of past times as well as folk art traditions and techniques.My collages, large wall quilts and garments bring together precious fragments to form evocative compositions. The viewer is forced to re-examine fabrics that have become flawed through wear and tear, to find in them a new beauty. In 2016 I wrote "Textile Collage" which shows how found and cherished textiles can be used to create visually rich and thoughtful collages. This book is published by Batsford and can be obtained or ordered through your local independent bookshop.